Users of SALAR.IT accept and agree to respect all the conditions included in this declaration. 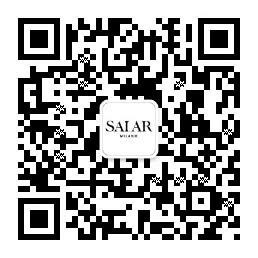 The access and the use of the website SALAR.IT are for personal use only. The visualization of the website SALAR.IT provides Clients with product information and the possibility to purchase merchandise. SALAR MILANO S.r.l. declines any responsibility that, due to a particular configuration of a Client’s computer or malfunction, the colors of the products visualized on the website could appear to be slightly different from the original. Images on SALAR.IT belong to SALAR MILANO S.r.l. and any unauthorized use of these images without the express written consent SALAR MILANO S.r.l. is forbidden. The Products are the property of SALAR MILANO S.r.l. and sold on its SALAR.IT Website for this SALAR MILANO S.r.l. guarantees the authenticity of each and every item featured. Once an order request has been received, SALAR MILANO S.r.l. reserves the right to re-confirm the availability of the merchandise. Clients will be informed if, for any reason, the item ordered is not available or if the order cannot be processed as per the Client’s request. SALAR MILANO S.r.l. is the owner of the website SALAR.IT and its contents; the material included in the website SALAR.IT is protected by copyright. Reproduction, modification, transmission, re-publication and/or re-distribution to third parties for commercial purposes are strictly prohibited without the express written consent from SALAR MILANO S.r.l. SALAR MILANO S.r.l. does not allow the use of the website’s contents or the trademark for any other purpose than what is written above. SALAR MILANO S.r.l. reserves the right to decline an order in the event that the order does not receive express verification or approval from the Client’s bank. SALAR MILANO S.r.l. reserves the right to delay a shipment if the order is not able to be shipped for reasons beyond our control. Please note that during promotions and sales there may be delays in immediate shipping. SALAR MILANO S.r.l. reserves the right to decline to process an order and/or offer services to anyone at any time. SALAR MILANO S.r.l. publishes information on its website SALAR.ITto provide a service to Users, but declines any responsibility of the possibility of eventual technical inaccuracy and/or typographical errors. Once notified, SALAR MILANO S.r.l. will execute an immediate correction. SALAR MILANO S.r.l. also reserves the right to make corrections and changes to the website when necessary without giving prior notice. SALAR MILANO S.r.l. does not offer any guaranty that the information published on its own website, is in conformity with the laws of the User’s competent jurisdiction. SALAR.IT, the website of SALAR MILANO S.r.l. , is a protected website according to international Internet standards which, if used correctly, Users can be reassured not to encounter viruses. However, SALAR MILANO S.r.l. declines any responsibility from eventual problems, damages, viruses or risks that the User may incur during the misuse of the website and declines any responsibility from eventual faulty operations of the website due to the deactivation of “cookies” in the User’s browser. SALAR MILANO S.r.l. reserves the right to modify the terms and the conditions contained in this legal note when it is necessary without giving prior notice. Entering this website the User and SALAR MILANO S.r.l. agree that the laws and the regulations of the Italian State will enforce any questions pertinent to the use of the website. SALAR MILANO S.r.l. does not guarantee in any way that materials present on the website are in accordance with current regulations of other countries, and the access to those materials from places where the relative contents are illegal is expressly prohibited. Users who choose to enter this website from said locations do so at their own risk and are solely responsible to respect relative local laws. SALAR MILANO S.r.l. – registered office in viale alfieri 6/c 73100 Lecce Italia – creator and promoter of the activities available on the website SALAR.IT , reserves the right to use personal data, voluntarily provided by users, in compliance with current regulations (Article 13 of Legislative Decree 196/2003). SALAR MILANO S.r.l. guarantees Users that personal data collected will be reserved for use strictly connected to rendering of services, facilitation of site management and processing of orders. If paying by Credit Card, the information essential for the success of the transaction (credit card / debit card number, expiration date, security code) will be sent to authorities responsible for processing or possibly to the company responsible for monitoring fraud using encrypted data, in no way will third parties have access. This information will never be seen or stored by SALAR MILANO S.r.l. Personal data will be processed by automated tools only for the time strictly necessary to complete the tasks for which it has been collected, or subsequently processed, in accordance with the provisions of article 11, letter e) of the Privacy Code. SALAR MILANO S.r.l. takes all appropriate preventive security measures set out by the Privacy Code in order to avoid the risk of destruction or loss of data, unauthorized access or use that is illicit or non-compliant with the purpose of its collection. However, SALAR MILANO S.r.l. cannot guarantee that the measures taken for the safety of the website, data transmission and information on the website, limit or exclude any risk of unauthorized access or dispersion of data by devices pertaining to the User. For this reason, Users are advised to make sure their computer is equipped with appropriate software to protect the network transmission of data (such as updated antivirus) and that their Internet service provider has taken appropriate measures in securing network data transmission. Users may, at any time, exercise the rights stated by article 7 of the Privacy Code in order to obtain confirmation of the existence or not of their personal data and to ascertain their content and origin, check accuracy or ask for the data to be integrated, updated or corrected. Under the same Privacy Code, Users may also request that their data be deleted, converted into an anonymous form or blocked from any data processing in violation of the law, as well as refuse processing, in any case, for legitimate reasons. Requests should be sent to the Data Controller, SALAR MILANO S.r.l. at the following email: support@salar.it. . Through this email the User may request an updated list of all the Data Processors appointed by the Data Controller. SALAR MILANO S.r.l. – registered office in viale alfieri 6/c 73100 Lecce Italia– creator and promoter of the activities available on the site SALAR.IT, reserves the right to use personal data, voluntarily provided by users, in compliance with current regulations (Article 13 of Legislative Decree 196/2003). Cookies are small files that are sent to your browser and stored on your device when you visit a website like SALAR.IT, Cookies allow efficient operation of the site, optimizing the browsing experience by remembering user preferences. They also provide information to the owner of the site for statistical purposes or advertising. We will respond to these requests within 5 (five) business days. SALAR.IT shall be liable to the Client for any lack of conformity which arises within two years of the goods delivery. For the purpose of this directive, goods are presumed to be in conformity with the contract if they, where applicable, comply with the following conditions: a) are fit for the purposes for which goods of the same type are normally used; b) comply with the description given by SALAR.IT and possess the qualities of the goods which SALAR.IT has held out to the consumer as a sample or model; c) show the quality and performance which are normal in goods of the same type and which the consumer can reasonably expect, given the nature of the goods and taking into account any public statements on the specific characteristics of the goods made about them by SALAR.IT , the producer or the producer’s representative, particularly in advertising or on labelling; d) are fit for any particular purpose for which the consumer requires them and which the consumer made known to SALAR.IT at the time of conclusion of the contract and which SALAR.IT has accepted through implication. The Client loses all benefits of their rights if they do not inform SALAR.IT of the lack of conformity within a period of 14 days from the date on which they detected such lack of conformity. In the case of a lack of conformity, the Client may request, alternatively and without charge, under the conditions below, a repair or replacement of the purchased goods, a reduction of the purchase price or the contract rescinded, unless the request is objectively impossible to satisfy or considered disproportionate for SALAR.IT in accordance with Article 130, paragraph 4 of the Consumer Code. The request must be submitted in writing to SALAR.IT at the email address support@salar.it, from which a written response will be given within 5 (five) business days. In the shortest amount of time possible, it will be communicated if the request can be processed or an explanation for why it cannot be. In the communication, where SALAR.IT has accepted the request from the Client, it must be stated the method of shipment or return of the goods, as well as the deadline for the return or replacement of the non-conform goods. Whenever the repair or the replacement of the goods is impossible or disproportionate, or SALAR.IT did not provide the repair or replacement of the good within the previously mentioned deadline or, finally, the repair or replacement caused notable inconvenience to the Client, the Client may request at their choice, a reduction of the purchase price or the contract rescinded. In this case, the Client must send their request to SALAR.IT, who will respond within 5 (five) business days with their intention to process the request or an explanation for why it cannot be processed. In the communication, where SALAR.IT has accepted the request from the Client, it must be stated the price reduction or the return method of the non-conform goods. All prices published online, payments and invoices are in Euro (€/EUR) or Dollar ($). GROUP A: ALL INCLUSIVE that is inclusive of the courier cost and customs duties. Due to local customs policies, some shipments can be considered as commercial imports and not for personal use. Commercial imports require the intervention of a broker to issue the package and in this case customers will be required to choose a broker and pay for the customs clearance service. Unfortunately, the costs related to the disbursement through brokers are charged to the customer. GROUP A countries: AUSTRALIA, AUSTRIA, BAHRAIN, BELGIUM, BULGARIA, CANADA, CHINA, CROATIA, CYPRUS, CZECH REPUBLIC, DENMARK, FINLAND, FRANCE, GERMANY, GREECE, HK, HUNGARY, INDIA, IRELAND, ITALY, JAPAN, KUWAIT , LATVIA, LITHUANIA, LUXEMBOURG, MACAU, MALTA, MONACO, HOLLAND, NEW ZEALAND, NORWAY, OMAN, PHILIPPINES, POLAND, PORTUGAL, QATAR, ROMANIA, SAN MARINO, SAUDI ARABIA, SINGAPORE, SLOVAK REPUBLIC, SLOVENIA, SOUTH KOREA, SPAIN , SWEDEN, SWITZERLAND, TAIWAN, THAILAND, TURKEY, UNITED ARAB EMIRATES (UAE), UNITED KINGDOM (UK), UNITED STATES OF AMERICA (USA). GROUP B: only shipping costs are included, the relative customs duties are charged to the customer. Prices and shipping costs are subject to change at any time, but these changes will not affect orders for which a Shipping Confirmation has already been sent to the customer. Payments for all orders must be made by credit card or paypal on the payment page. Payments through most major credit and debit cards are accepted. The customer must be aware of the fact that online payment transactions are subject to validation checks by the card issuer and that SALAR MILANO S.r.l. will not have any responsibility in case the card issuer refuses to authorize payment for any reason. In addition, a standard pre-authorization check on the customer's payment card will be carried out and the Products will not be shipped until such pre-authorization verification has been completed. Please note that the card issuer may charge the client an online management fee or processing fee. SALAR MILANO S.r.l. can not be held responsible for this. SALAR.IT Clients are guaranteed maximum Credit Card security because all transactions are processed using a secure server. SALAR.IT CUSTOMER SERVICE AGENTS WILL NOT ASK FOR NOR ACCEPT CREDIT CARD NUMBERS AND/OR EXPIRATION DATES. SALAR.IT advises Clients to apply for E-commerce security PIN CODES provided by Verified by Visa and SecureCode by Mastercard. If there are sufficient funds and the account information is valid, the transaction will be processed instantly. At the moment the order is confirmed, the Credit Card will be charged for available items. When Bank Wire Transfer is selected as the method of payment, the Client will automatically receive an email containing the bank account information for SALAR.IT. The merchandise will then be reserved for the order until payment has been confirmed. The Client is asked email a scanned copy of the Bank Wire Transfer within 48 hours of receiving the email request for payment. It is mandatory that the Client email a scanned copy of the Bank Wire Transfer within 48 hours to avoid the cancelation of the order. Merchandise will be shipped once the payment has reached SALAR MILANO S.r.l.’s bank account. If the fax or scanned copy of the Bank Wire Transaction is not received within 48 hours of the request, the order will be cancelled. The merchandise will be shipped once SALAR MILANO has confirmed the payment and the merchandise is available for shipment. For Credit Card and PayPal payments SALAR.IT may request the Bank or PayPal to double check the transaction and the account information. This verification process will delay immediate shipping. Clients who have received a Promo Code for SALAR.IT , by newsletter, through social networks or on approved promotional websites, can insert this code during checkout. Each code has a validity, start and end date, which limits its use and cannot be extended. If for any reason Clients are not satisfied with an order, the items can be returned for Color Exchange, Store Credit or Partial Refund within 14 days of the order’s delivery date. - To request authorization to return, you must send an email to support@salar.it. SALAR.IT will send a confirmation by e-mail, containing the Return Authorization Number (R.A.N.) and the instructions to be respected to send the goods back. - The return shipment made with the courier indicated by SALAR.IT will be FREE in case of Color Exchange or Store Credit. - If the return is returned using a different courier, all costs will be charged to the customer. Return shipping is free when returning an item for Color Exchange. Items can be exchanged only when a different color of the same Item Code is available. If the item is returned a second time, the compensation will be a partial refund. Any customs fees for the shipment are the responsibility of the Client and must be paid at the time of delivery. - must be used in its entirety on an order that is either equal to or greater than the value of the Store Credit. The cost of return shipping is EUR 30. This amount will be deducted from the final refund. Please follow attentively all given instructions. Make sure to print and use the pro forma invoice and shipping label that are provided. Sometimes Customs may apply import fees. These fees will be the Client’s responsibility and will be deducted from the final refund. Partial Refunds will be processed as soon as returned items have been checked and accepted by SALAR.IT. For orders paid by Credit Card, the refunded amount will be available to Clients in roughly 10 days and within their next billing statement. Processing time may vary depending on the Credit Card Company.Orders paid by PayPal will be refunded to the original account. Partial refunds will be issued in the same currency as the original purchase. Any differences in the amount refunded are due to exchange rate fluctuations and will not be reimbursd. In the case of defective or incorrect merchandise, Clients must follow the instructions above. SALAR.IT, reserves the right to request photographic support regarding defective or incorrect merchandise before authorizing a return for full reimbursement of shipping and import fees..
Pickups for all authorized returns with SALAR.IT ’s courier account numbers must originate from the same country of the original shipment. In the case that the return shipment requires pickup or the payment of any added fees, SALAR.IT reserves the right to refuse returns sent with a different courier than specified in the confirmation email. SALAR.IT reserves the right to refuse returns that are unauthorized and/or not sent in accordance with the Return Policy detailed on the website. In the case of unauthorized or non-standard returns, the merchandise will be returned to the shipping address specified in the original order. If an unauthorized return is accepted, SALAR.IT will deduct a 10% administrative/re-stocking fee from the refund.